Getting your nails done can land you in the manicure archives on Tuesday when New York artist Breanne Trammell stops through Capitol Hill’s Creature ad agency on a tour called Nails Across America. Trammell, a Printmaking grad from the Rhode Island School of Design is collecting oral history’s from manicure clients during a road trip across the country, and now it’s Seattle’s turn. On the road since May 28, Trammell will arrive on Capitol Hill Tuesday June 18, and begin profiling locals for her project. The trip will conclude with a published archive based on 500 sets of nails, as well as the people behind them. Trammell who actually became a licensed nail tech in New York for the project says she will “document these exchanges with audio recordings, photography, and video to create a web-based project archive.” A few of those archive entries could be Capitol Hill residents. Trammell will work on 21 sets of Seattle nails over the course of three days – June 18 – 21. If you are quick about it you can be one of the nail polished participants by contacting the Creature front desk to set up an appointment – details below. The manicures are free too. The unique excursion was conceived by Trammell, and Creature designer Clara Mulligan during a visit to Seattle. Now a reality, Mulligan has been helping Trammell with design materials for the project currently cruising the USA. Starting in New York, Trammell has taken her manicures to seven states so far, and is heading north from Portland to make Washington the 8th. 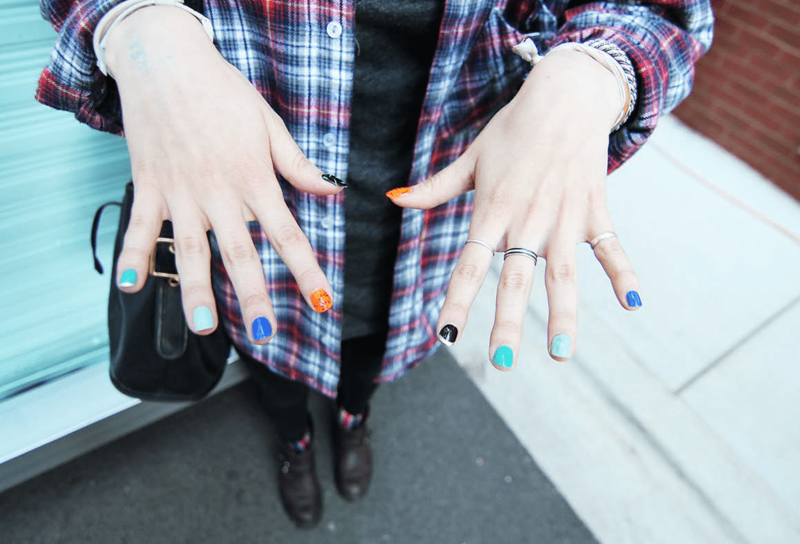 She is also bringing along a styling nail salon that the artist has pulled behind her car since leaving the East Coast. When you see a 1968 Shasta Compact trailer zooming through Capitol Hill you’ll know the manicurist has arrived. Dubbed the ‘Canned Ham Trailer,’ the vintage space on wheels will act as Trammell’s manicure workshop for two of her three day stay. On Tuesday, Trammell will set up in Creature near the space’s window. Creature creative director Pam Fujimoto says this will be “the best time for people to come by and to view her in action.” On Wednesday and Thursday she will return her work to the can of ham. Trammell with her unique office is also bringing some unique nail designs. Participants will get a chance to pick from the artist’s pop culture, junk food inspired “menu of options” a press release reads. Some selections include a yummy “Cheeto orange” or “custom designs like donut sprinkles.” The release says she also does takes on art history, once glossing up nails with “Richard Diebenkorn inspired paintings.” With a name like that you he was a legit painter, but creating painting inspired nails nationwide does call for funding. Trammell has been crowdsourcing dough to support her “experiential art project,” her Kickstarter reads, and by donating you can help the ambitious manicurist buy gas, get oil changes, and keep her archive of nail stories going long after departing Seattle. New York artist Breanne Trammell is making a stop in Seattle at ad agency Creature, as part of her cross-country road trip Nails Across America. She will be giving manicures in Creature’s street-facing windows on Capitol Hill next week Tuesday – and in front of the office in her mobile salon/trailer on Wednesday and Thursday. Creature is currently taking sign-ups for free manicures in their front windows at 1517 12th Avenue, Suite 101. Call the front desk at 206-625-6994 to sign up for a time slot for Tuesday, June 18 and Wednesday, June 19. The road trip is part of Nails in the Key of Life, her experiential art project using manicures as a forum for exchanging ideas, conversation, and collecting oral histories. The end goal is to create an archive based on manicuring an edition of 500 sets of nails. Following each manicure, participants will receive a signed and numbered (1/500, 2/500, 3/500 and so on) letter-pressed certificate of authenticity to commemorate their participation. Fun! Looking forward to hearing the stories she collects.